Today is the official beginning of Advent, the period of time in which Christian tradition celebrates the first “coming” (which is what the word “advent” means) of Christ – His birth. I love traditions, and building familial bonds through experiences, and Advent season lends itself to this perfectly. However, as I began to research ways to celebrate Advent season with children, I quickly became overwhelmed (a Google search reveals 1000+ Pinterest ideas). There were some traditions that light candles on an Advent wreath on Sundays (beginning with the fourth Sunday from Christmas or closest to November 30), others began on December 1, some did biblical readings, others read a different Christmas themed children’s book every day, while still others were filled with crafts and activities. So many ideas to choose from, that I initially didn’t choose any. Then, a few years ago, I became fixated on creating my own Advent calendar. Enoch was still eating baby food, and I came across this craft that used baby food jars to create an Advent calendar shaped like a tree. Such a wonderful, creative, resourceful idea, that I decided to do it. That first year, I didn’t get the calendar completed until the middle of December. The next year I was excited because the calendar was complete and all I needed to do was fill each of the 24 jars with a Christmas related activity. That was a great idea, on paper. In practice, I didn’t plan properly and baking cookies, completing a craft, or going to view Christmas lights back to back became too much for us to manage. Then, I decided to use the 24 book idea – until the library I used didn’t have most of the books I needed. So, here we are today. And, I’ve decided to go back to the basics. Advent was designed to focus on the coming of Christ. To celebrate the arrival of the One who would eventually die for our sins and make it possible for us to be in relationship with God. We will not divorce the joy of the festivities from scripture reading, because celebration is found throughout Scripture. But, I am simplifying and not overwhelming myself (let’s face it, being anxious about getting it all done is the antithesis of the season). I left the baby food jar Advent calendar in storage and will grab 3 chocolate Advent calendars from Trader Joes. And, we will celebrate using an Advent devotional with the kids – the basics. I’ve looked into a few options – just 6 – and listed them here, so that you don’t have to start from scratch (you are welcome). Advent Catechism on Story Catechism which engages questions and answers to converse with children about the story of Jesus. Advent Readings for the Very Young on Part of the Main, uses this Playmobil nativity scene (with the three wise men). Each day children build upon the nativity scene by adding a figure, which coincides with a short reflection, prayer, and additional Bible passages. The Best of All Kids’ Advent Devotional by the Gathering Church, is a weekly devotional that incorporates Christmas carols and readings adapted from the The Jesus Storybook Bible: Every Story Whispers His Name>. Celebrate Advent Using the Jesus Storybook Bible by Adriel Booker, is a printable reading plan that utilizes stories from The Jesus Storybook Bible. There are 21 Old Testament stories, and three New Testament stories leading up to the birth of Christ. It is one of the best children’s bibles available. Beautiful illustrations, and wonderful stories that all point to the coming of Christ. Printable Advent Reading Plan on Not Consumed is a free daily printable that highlights one passage a day to be read during the month of December. 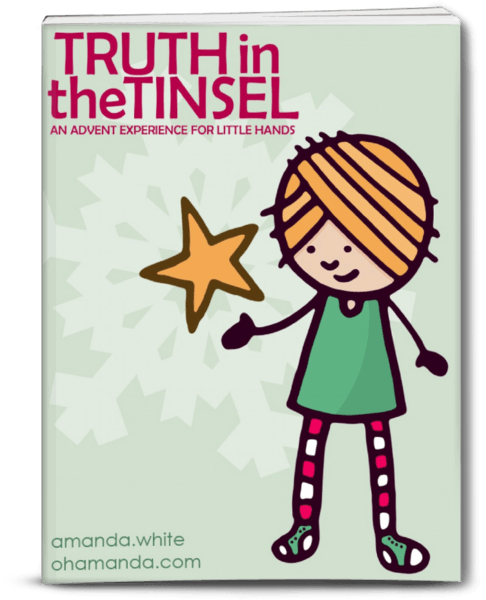 Truth In The Tinsel by ohAmanda.com is a hands-on devotional that provides themes or clues for each day, that coincide with bible passages. Each day includes a craft for children to make. The website includes a video telling you how to use the book, and the book itself provides a list of needed supplies and templates to be used for the craft. We landed on the Truth in the Tinsel, for this year. I love the idea of combining a craft with the bible reading, in addition to conversation starters and other suggestions. Also, as much as I love the Jesus Storybook Bible, it is better suited for school age children (because of vocabulary and length of stories), so we will give it another year for the girls. Now, I still want to include fun activities to do with our kids along the way. 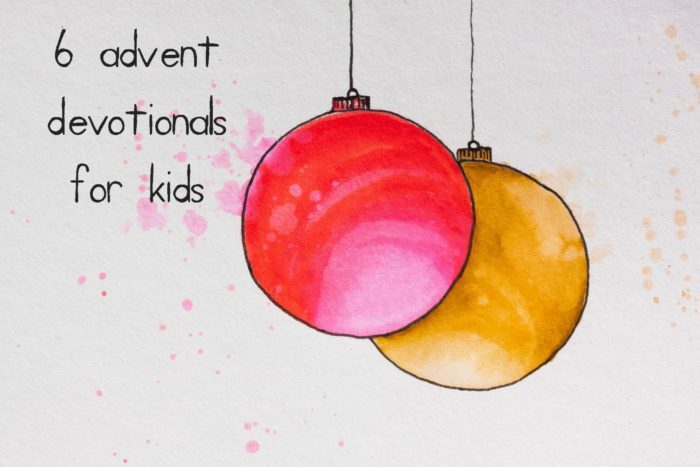 Adriel Booker has created the Ultimate List of Family Advent Activities and Christmas Countdown Fun. 150+ activities divided into categories like serving, faith-based, outings, etc. Stay tuned for updates as we journey through this month.